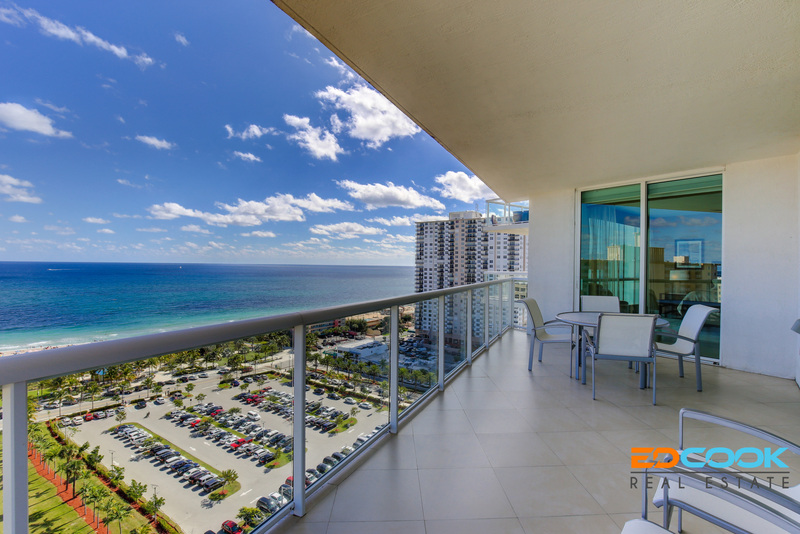 The Plaza at Oceanside is a breathtaking, magnificent condominium located one block from the Atlantic Ocean in Pompano Beach, a TripAdvisor top beach resort destination location. 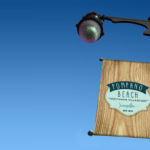 Located at 1 N. Ocean Blvd on the northwest corner of A1A & Atlantic Blvd. the building features breathtaking iconic architecture. The distinctive contemporary curved glass design resembling an ocean wave. When you first enter The Plaza, the sky lobby is modern and spacious. 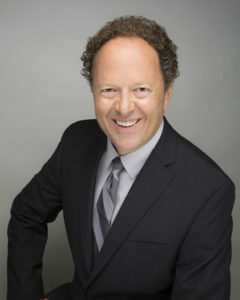 Friendly concierge is available 24-hours per day 7 days a week. The overall quality of construction and the tasteful modern design is readily apparent. 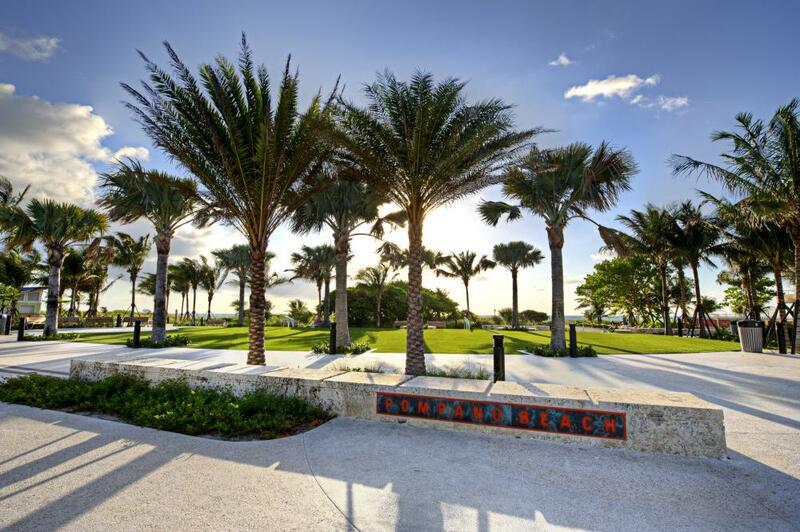 The amenities are incredible: Welcome to a world-class resort lifestyle. Unique living experience. Spanning across the entire 4th floor is the amenity floor. The Plaza has over 40,000 square feet of indoor and outdoor amenities.The amenities located on the entire 4th floor are extraordinary. The Plaza’s hallways on the 4th floor feature museum quality gallery artwork and sculptures carefully selected. Beautiful well appointed public rooms are located throughout the floor. Residents begin their day at the circular designed friendly News Cafe for morning coffee continental breakfast served daily and newspapers, residents can catch the news on 6 multi-screen flat screen TVs in a comfortable seating area and a wall street stock ticker. Great start to the day to meet and greet fellow residents. The amenities level includes a state-of-the-art fitness center with mens and women spas and massage tables, sauna and juice bar. The fitness center features advanced cardiovascular and strength training equipment from Star Trac. There are fitness trainers and classes regularly. The amenities level also includes a club room with large outdoor terrace with comfortable lounge seating areas to enjoy the breezes with beautiful Atlantic Ocean views, a wine vault with a large magnificent marble table for private dining, cigar humidor, a library & media center, a sports lounge with billiards, children and teen rooms and even a virtual golf simulator to practice your game. Residents also enjoy a multi-tiered surround sound theater with regularly scheduled movie nights. 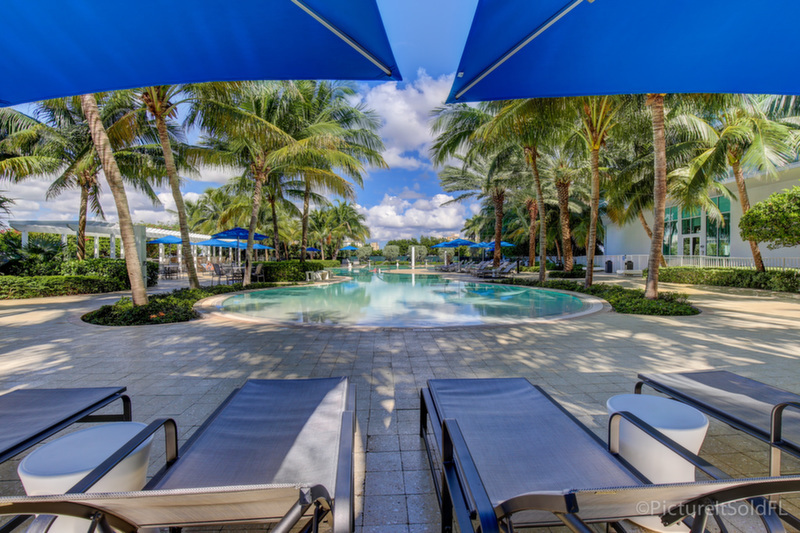 The outdoor amenities feature a huge lush tropical resort temperature-controlled infinity-edge swimming pool with beach entry on one end, and a lap pool on the other with a whirlpool spa. There is a BBQ grill area and two hard-surface tennis courts. The Plaza has a collection of sky residences, loft homes and also penthouse residences. 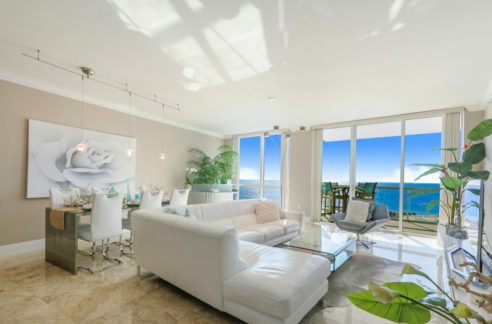 Residences range in size from 1,443 square feet to 4,500 square feet with 2 bedrooms, 3 bedrooms and 2 to 3 and a half baths, The oceanfront sky residences are accessed by private elevator entry to only your own residence. 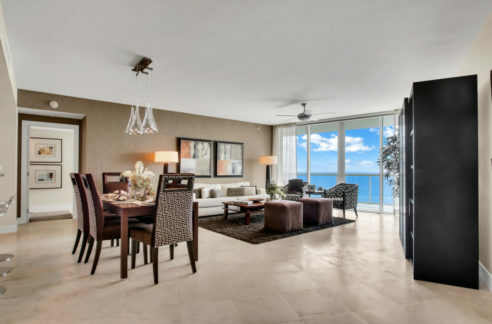 The residences feature fabulous ocean and /or intracoastal views. Private or semi-private elevators lead residents to the 186 spacious residences. The floor plans are excellent. 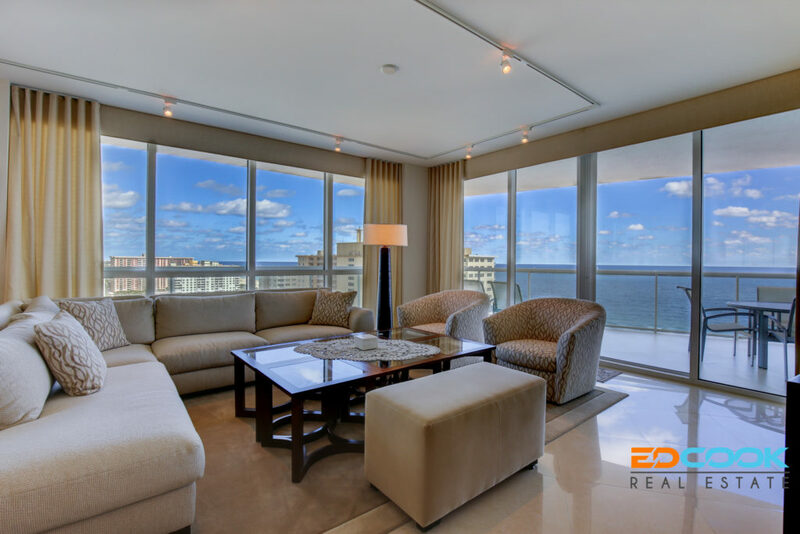 Residents can choose intracoastal views, Atlantic Ocean views or even both. Pets are permitted and owners may lease their residences for minimum periods of 6 months. Residences feature Valli & Valli brushed chrome hardware, individual climate control, dedicated laundry room with front load Duet Washer and Dryer, floor to ceiling windows, sliding glass doors to over-sized terraces with glass panels. The kitchens in the Plaza residences feature Poggenpohl European designed cabinetry, granite countertops, Danze stainless steel faucets, Viking stainless steel dishwasher and dryer, Viking electric glass 5 burner stainless steel cook top and range hood and a Viking single stainless steel oven and microwave. The bathrooms at The Plaza feature European style flat panel Poggenpohl cabinetry, marble floors, oversized jacuzzi tubs, his and hers vanity areas with marble countertops and oversized showers with a frameless glass enclosure. 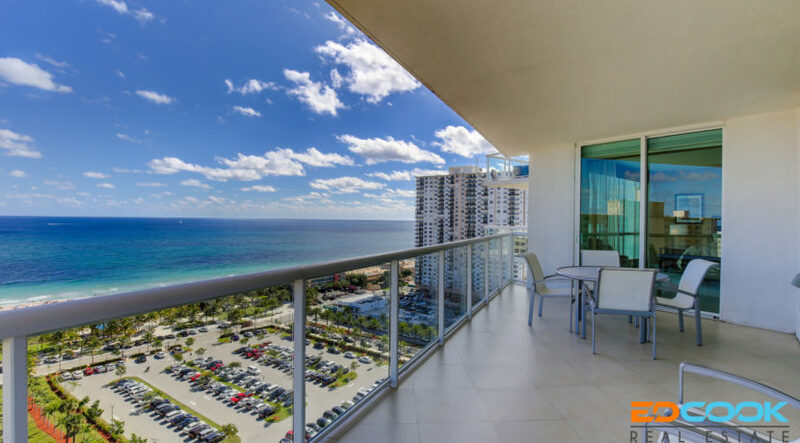 The Plaza is perfectly located to enjoy the best of both the intracoastal, and the ocean. Houstons, Sunset Catch and the Rusty Hook restaurants are literally steps away on the intracoastal side. 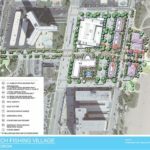 On the ocean side, the planned Pompano Beach Fishing Village will feature direct on the beach dining. Grocery shopping is a short walk to Publix and a brand-new Whole Foods minutes away.